According to forecasts from its finance ministry, Hong Kong will post a surplus of HK$92.8 billion (US$12 billion) for the fiscal year ending March 31 (pdf, p. 24). That’s the highest in nearly a decade and eight times bigger than the original estimate. 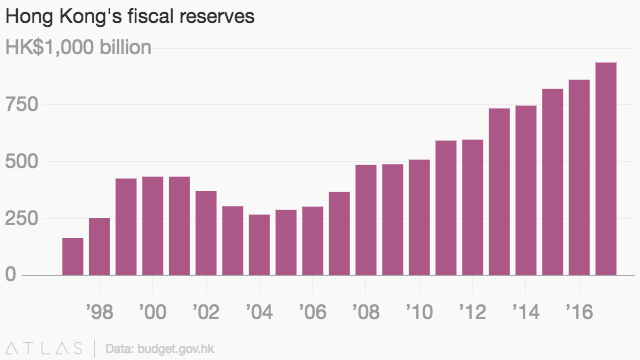 With the hefty surplus, fiscal reserves are expected to reach an all-time high of HK$935.7 billion. Finance secretary Paul Chan cited a “period of hectic trading in the property market.” He noted the vast majority of the surplus will come from the “far higher-than-expected” land revenue and stamp duties on property—set to be 76% and 16% higher than year-ago estimates, respectively. The government will allocate two-thirds of last year’s surplus to long-term investments in social welfare and support for the tech sector. The rest—some HK$35 billion—will be given to locals in a series of tax relief measures. For the current fiscal year those will include one-off 75% reductions in both the salary and personal assessment taxes, capped collectively at HK$20,000. While the one-off sweeteners are in line with the government’s usual practices over the past few years, Chan also introduced some new recurring measures. One will widen the salary tax bracket increments from HK$40,000 to HK$45,000. That alone will benefit 1.8 million taxpayers—half of the working population—and reduce government revenue by HK$16.4 billion each year.